If you follow me on Twitter, I've been on the record saying that R.A. 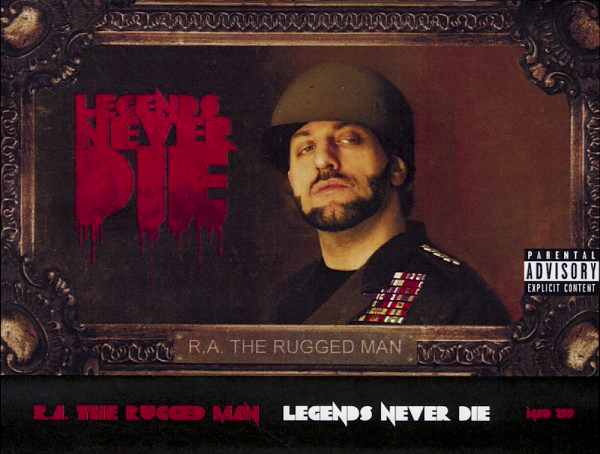 The Rugged Man's album, 'Legends Never Die,' was everything that Nature Sounds could have asked for from R.A. Not only did he deliver an amazing album filled with content, deep lyrics, and great production, but also his signature flow and a desire to really promote the album. He abandoned the industry's model that an album is old the day it's released and continued to push singles, tours, and create powerful visuals for tracks long after the album was in stores. It gave the project more life and lasting power than most albums that have been released since. Tracks like the Mr. Green produced 'Learn Truth' with Talib Kweli is off the page with its bars and delivery, while 'Daddy's Halo' is a heartfelt tribute to his father, where he nearly breaks down at the end of the recording, not to mention those incredible visuals for 'Still Get Through The Day' with Eamon. Say what you will about R.A. the Rugged Man, he's built his fanbase on the merit of his skills. Obviously, a lot of things he's said and done have been over the top, but I've briefly met R.A. & he seems like a stand-up guy. He cares about the culture and is extremely knowledgeable about its history. The album was released on this day in 2013, but it may as well be brand new because lyrically there's still much more to uncover and the tracks I enjoy have plenty of replay value. The over the top stuff not as much, but I trust it brings a unique energy to his shows. The more room he has to create, the more we'll see R.A. shine.